Now here's a success story that will get the young and not so young motivated into achieving any goal that you set for yourself. If a little girl can do it, then so can you! The M3 Girl Designs was started by a 10 year old girl, Maddie Bradshaw, who wanted something unique for her locker at school. After a little brain storming she came up with what is now known as "Snap Cap's". Snap cap's takes a simple bottle cap and turns it into an interchangeable magntic piece of art. 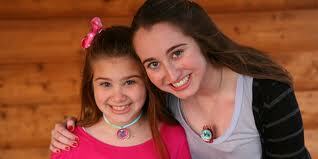 They were so popular that Maddie decided hey, why not take this concept and make an accessory that you can also wear. The first Snap Cap Necklaces were born and the M3 Girl Designs business has continued to grow ever since. which she started with a $300 investment when she was only 10 years old. Her sister Margot, now 12 years old, is the vice president and assistant designer. While her Mom Diane, is the glue that ties it all together. In 2008 (a mere 2 years after starting) this tween business owner grossed over $1.6 million in sales with 50,000 necklaces sold per Month. Impressive? Yes it it, but it gets better. The M3 Girls (Maddie, Margot and Diane) have continued to grow their line of Snap Caps as more tweens come of age. They were featured in numerous publications and t.v. shows way before they made their famous appearance on the Shark Tank Show. These include Inc. Magazine's 30 under 30 when she was only 13 years old, and the morning show The View on YouTube (excellent video btw if you haven't seen it yet) which helped launch the M3 Girl Designs and the Snap Caps Business into the stratosphere. The Bradshaw's were already millionaires from the Snap Caps when they went looking for an investor on the Shark Tank to take them to the next level. Current total sales at the time were over $5 million and over $1.5 million in 2011 alone. This was enough to get all the Sharks circling in on this deal. Maddie wanted $300k for a 15% stake in the tween business. They already had Snap Caps in over 1,000 stores and a major presence online with thousands of fans. If there is one thing to get the Sharks interested in your business, it's numbers like these. Maddie is now an old business pro at 16 years old while her vice president Margot is not quite a teenager yet. As you can imagine having the Snap Caps featured on the Shark Tank Show and getting 3 Sharks to invest in it, has greatly increased the sales volume. They are reported to be on track to do in excess of $5 million this year alone. They have continued to add to the magnetic Snap Caps line and have now began to expand on the Brand even further. You can now take the bottle caps and insert them into necklaces, bracelets, hair bows, note cards, journals and framed keepers to keep your entire collection in. Maddie is also an accomplished writer with her first published book called "You Can Start A Business, Too". Her book covers a collection of business terms, ideas, and stories to inspire young entrepreneurs how to start their own business. At only $6.95 available on the Snap Caps Online Website this is a fantastic gift for your young aspiring Entrepreneur. As a matter a fact I would also recommend the two college students with an MBA who were just on the Shark Tank to study this book as we'll. This is a True Success Story that is sure to keep growing as the two girls continue to develop their Brand. This is also a very good lesson for all parents in how to encourage their kids that they can accomplish anything they want in life if they are willing to work hard (and smart) for it. Maddie and Margot may be getting a lot of the attention, but without grounded parent's that were willing to help take a business idea into a multi-million dollar business in a few short years cannot be over looked. Personally I think Diane (their Mother) should also write a book of her own. She has sent her daughter's down a path that will continue to pay dividends for the rest of their lives.